During the Edo period, which ended in 1868, common people were not allowed to wear silk. The growing economical power of merchants came along with social disorder and corruption. Tokugawa government issued many sumptuary laws to limit the spending of the general people on luxury items. One way to avoid the punishment was to spend their wealth (tremendous wealth in some case) where it could not be monitered. 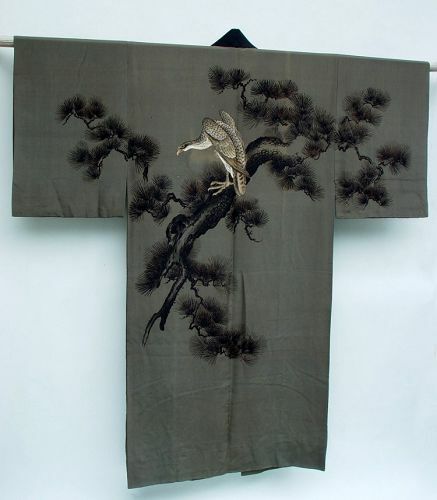 At the time, silk fabric made to look like cotton (tsumugi) became popular. The art work on this gown is exceptionally attractive. The design is calm and serene but the subject is deadly and aggressive, since hawks hardly miss their targets that they pray on. The ‘hawk on pine tree’ was a popular theme among artists during the Edo period (1603-1868). The first Tokugawa shogun, Ieyasu, was fond of hawking. Ieyasu (Tokugawa) himself spent his youth as a hostage to the Imagawa clan which was a powerful neighboring clan. He was sent out at Imagawa's request (also asked by Oda Nobunaga, another neighbor on the other side). He was not necessarily mistreated but he could have died had his family attacked them. It was a way of life back then. Peace did not last long. Only the predators and victims, it seems.